1. In mild stable isolated abdominal trauma, contrast enhanced ultrasound was 96% sensitive and 99% specific for organ injuries compared to CT.
2. 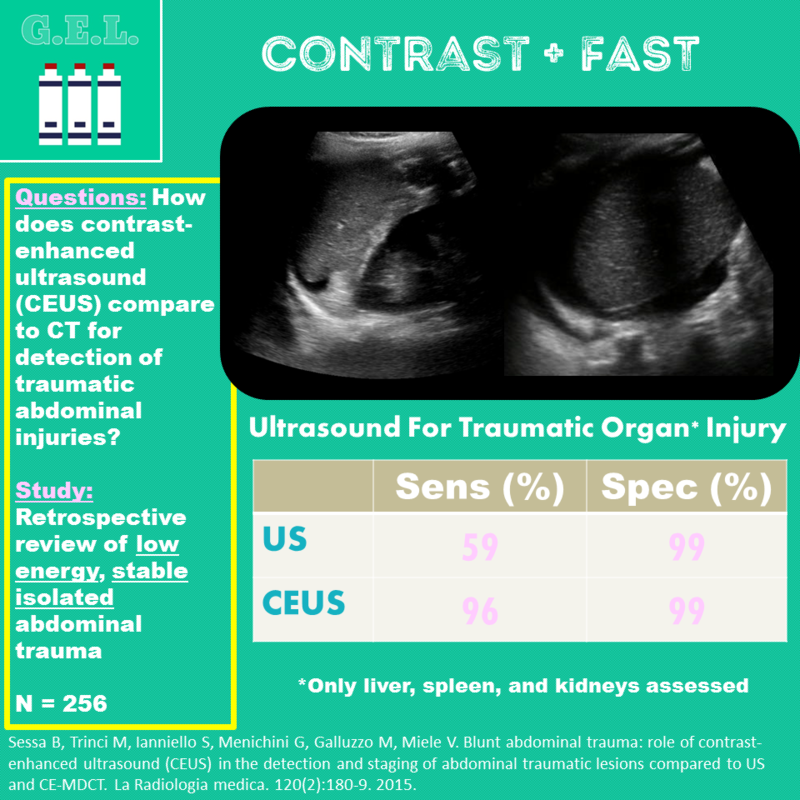 Contrast enhanced ultrasound has greater sensitivity for intrabdominal free fluid and solid organ injury identification compared to non-contrast enhanced ultrasound. High energy traumas usually will undergo pan-scanning with contrast enhanced multidetector CT imaging (CE-MDCT). Lower energy injuries may not need CT since it poses risks from radiation and IV contrast administration. The FAST (focused assessment with sonography for trauma) is commonly used to assess for free peritoneal fluid, which in the setting of trauma is assumed to be due to traumatic intraabdominal injury. Ultrasound has good sensitivity for free fluid, but low sensitivity for solid organ traumatic lesions. Prior studies have shown that contrast-enhanced US (CEUS) is more sensitive than non-contrast US for detected solid organ injuries. This uses stabilized microbubbles to “light up” areas of blood flow. It also makes it possible to grade the traumatic lesions. How does CEUS compare to MDCT for staging and detection of traumatic abdominal lesions in low energy isolated abominal trauma? Multi detector Computed Tomography (MDCT) was gold standard to calculate sensitivity, specificity, PPV, NPV, accuracy for both number of lesions and presence of free peritoneal fluid of US and CEUS. US: looked for peritoneal fluid but also parenchymal traumatic lesions (intraparenchymal hyper or hypoechoic area or distortion of normal echoic structure). CEUS: looked for peritoneal fluid and parenchymal lesions, intraparenchymal or subcapsular hematoma, active blush. Injuries appeared as hypoechic perfusion defect or linear lesions. Hematomas are nonenhancing areas. Extravasation of microbubbles outside lacerated organ suggests active bleeding. CT listed as having 2 false positives for free fluid - unclear from results but this is likely the physiologic free fluid in the pelvis of two young female patients. Appears as though this was counted as false positive for all scans. Do you need the ultrasound machine “contrast-pulse sequencing” to get these results? Even if US approaches the sensitivity and specificity of CT, does it provide enough information to be able to replace it? Authors conclude that “patients with negative CEUS may be discharged, monitoring the clinical and laboratory findings, without undergoing CT because only lower grade injuries could be missed”. What do you think?